hey lovelies! i'm back sharing the launch of the February kit in my shop! 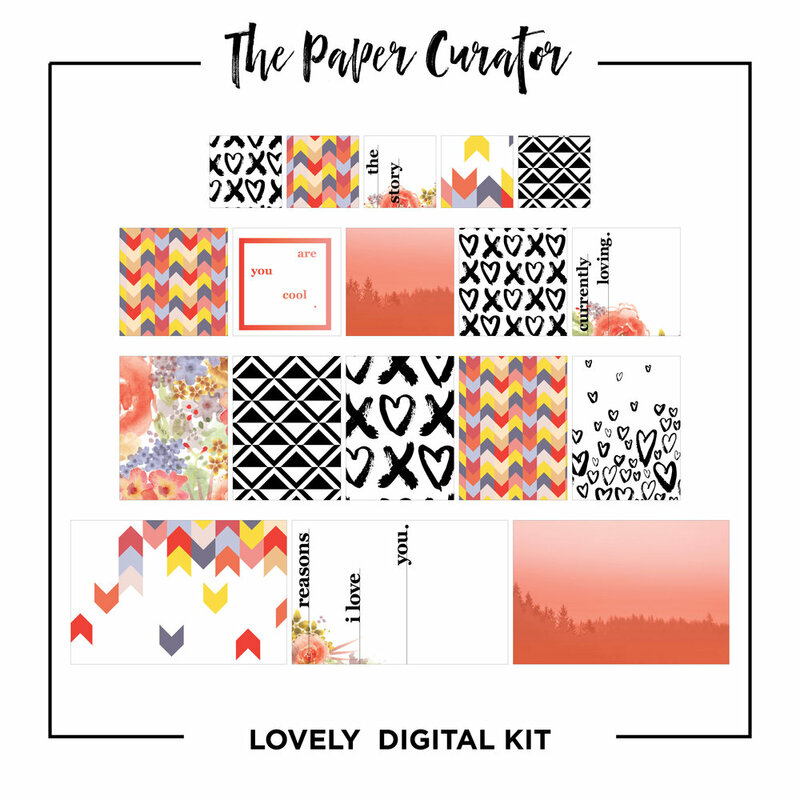 As well as a very exciting new announcement about kits–The Paper Curator is going digital ... and mini! I'm launching something new this month and that's digital and mini kits. 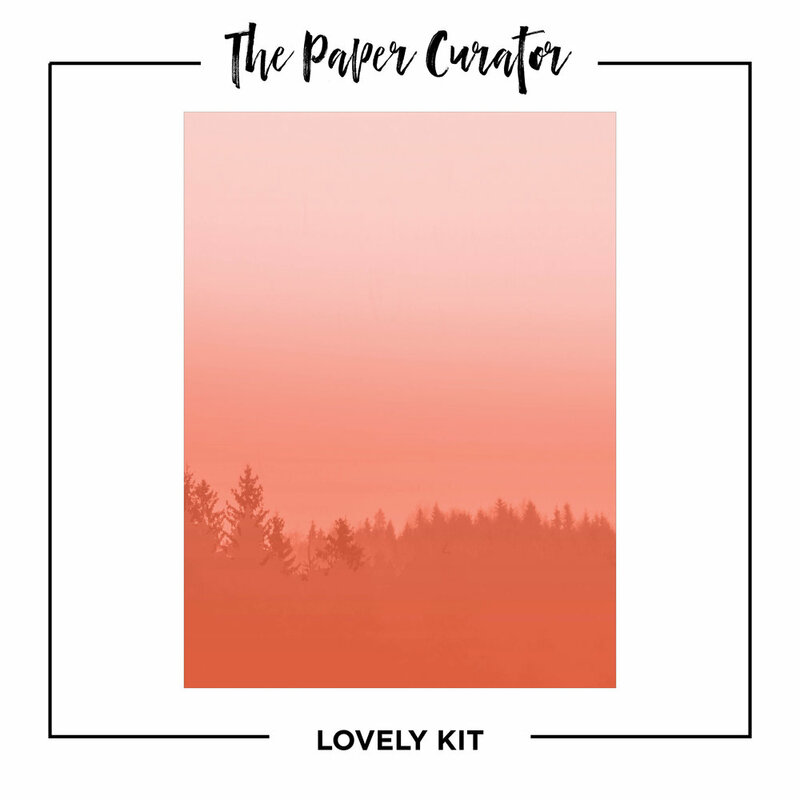 The digital kit includes all the cards from the physical kit but instead of 9x12 papers, you'll get 6x8 papers and you'll also get two additional 2x2 designs, and one additional 4x6 design when you buy the digital kit in it's entirety. Now, about mini kits–these are numbered mini selections in the digital format that you can purchase for $1–yes i said one dollar! For 1 buckaroo, you'll get one 8 1/2" x 11" sized PDF that has an assortment of cards (you choose which ones you want!) there's 3x4's with a 4x6, or 2x2's with 3x3's, etc etc, or just the larger patterns in a 6x8 too. You can see all the variations below or check 'em out in the shop! 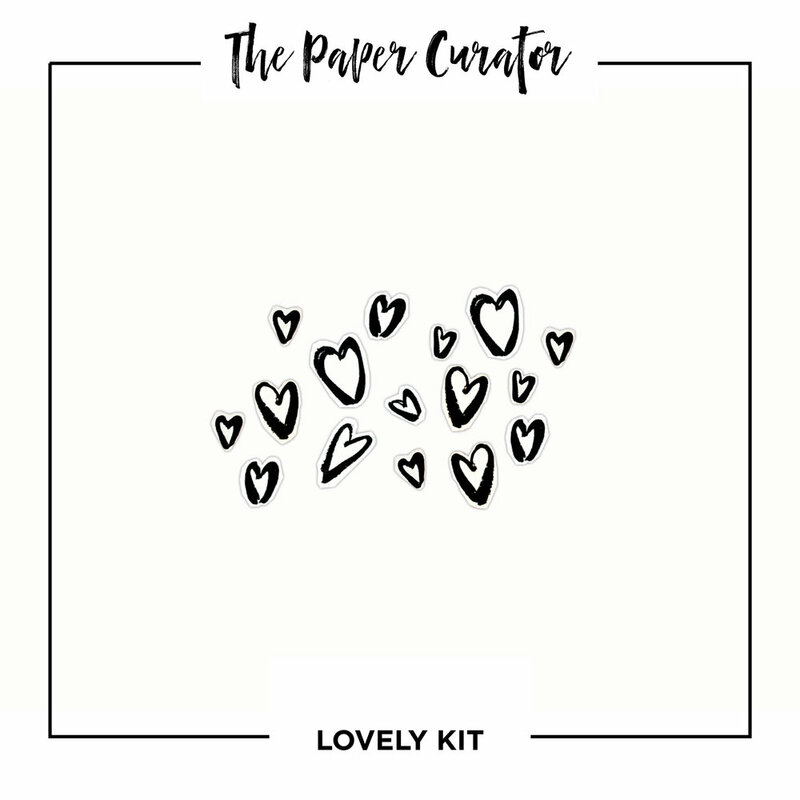 Now, if you're ready to check out this month's kit 'Lovely', look below to see what all you'll get in this month's kit, or head back to my sneaks post to see how i've put some of these items into action already! Above, you can see the overview of what you’ll receive in the kit, but keep in mind each card and paper are double sided (front side in top image, back side in bottom image), so you will receive (5) 2”x2” cards with (10) individual designs, (5) 3”x3” cards with (10) individual designs, (5) 3”x4” cards with (10) individual designs, (3) 4”x6” cards with (6) individual designs, and (1) 9”x12” paper with (2) individual designs–as well as (16) black heart die cuts! i hope you’ll check out this kit in the shop! and let me know what you think about it in the comments below. 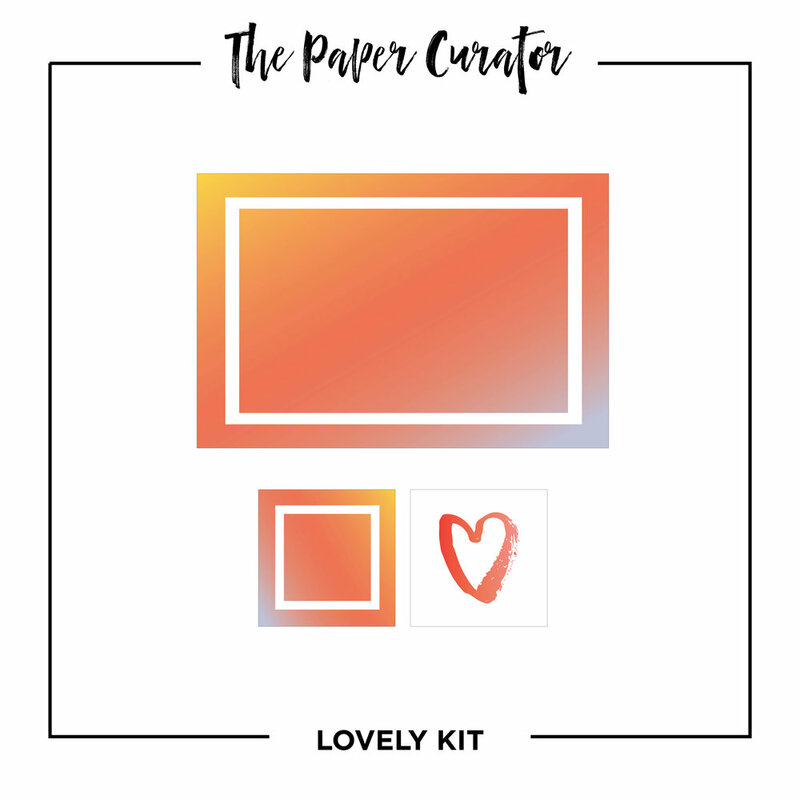 In this kit you'll receive a PDF with (12) easy to print 8 1/2 x 11" pages including all the designs you see above–(12) 2" x 2" cards, (10) 3" x 3" cards, (10) 3" x 4" cards, (7) 4" x 6" cards, and (2) 6" x 8" patterned papers. In the download, you'll also receive my tips and tricks for best printing and trimming practices so look out for those on the PDF! In each mini kit, you'll get the items pictured in 1 PDF document that's an easy to print 8 1/2 x 11" size. These pint sized designs are perfect for the digi gal who knows exactly what she wants. The same lovely colors and patterns from the physical kit are used in a budget friendly manner for the penny pincher. Plus, since you're printing them yourself, you can see these designs on vellum and transparency if you wish! Thanks for checking out February's Kits! What do you think of the digital and mini kit launch? Love it? Hate it? Let me know below!